Bathrooms are one of the most important rooms in the house and they’re often used when we’re in a rush – especially in the hectic mornings before work or the school run. 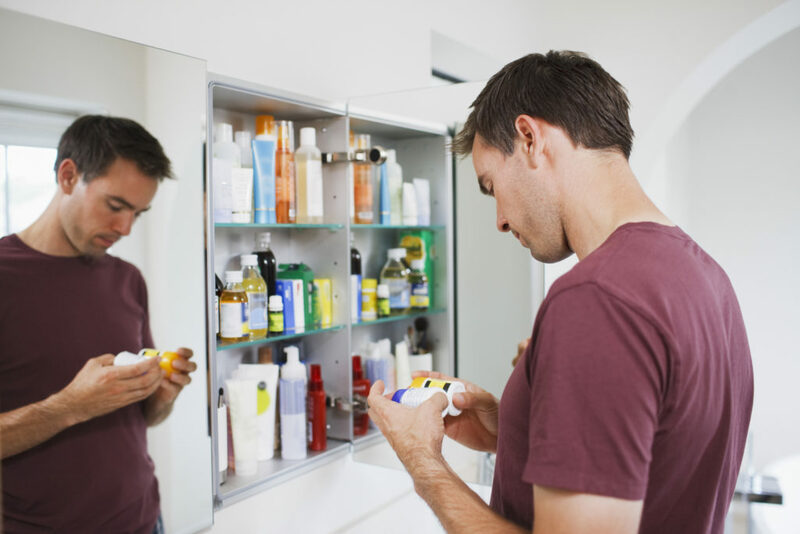 Whether it’s pyjamas, clothes, or towels on the floor, unwanted toiletries mounting on shelves, or dust around the outside of the bath, lots of details can contribute to a cluttered looking bathroom. These four tips will help you to have a good bathroom clear out – perfect for a spring clean at any time of the year – and give you a great start to keeping your bathroom clutter-free. Bathrooms can accumulate clutter in the form of bath toys, toiletry products, towels, cleaning products, and much more. The amount of stuff there is to keep in the bathroom often exceeds the space available – especially if you have a small bathroom with minimal storage options. To avoid letting this make your bathroom cluttered, it’s sometimes best to store non-essential items in a different room instead. Clearing everything out of the cupboards and away from the surfaces allows you to assess what you own and what you need, giving you the chance to properly consider what has to live in the bathroom and what doesn’t. By leaving just the bathroom essentials in your cupboards and storing everything else in another room, it’ll be easier to find things and keep everything organised. When everything is out of the bathroom and you’re left with just the toilet, sink, bath, and other furniture, take the opportunity to clean the room from top to bottom. With everything out of the way, you’ll be able to effectively clean all the areas that are usually hard to reach; inside cupboards, and behind the toilet and sink, for example. Cleaning the floors and walls thoroughly can also go a long way in making your bathroom look less cluttered, as dusty or grimy walls can contribute to a messy looking room just as much as actual mess can. Wall coverings like dedicated waterproof bathroom wall panels are easy to clean, so you can wipe down all the surfaces with antibacterial spray. Using a squeegee for the wall panels around the bath, shower and sink can help to avoid streaks. To keep the items that are to stay in your bathroom tidy and organised, there are a couple of tips that you can take inspiration from to make the most of your storage space. Using storage boxes in cupboards to group products together and keep them that way is the most common, but you can also make use of tension rods in cupboards to suspend spray bottles and free up extra room. There are also lots of opportunities to add storage in a bathroom, from installing shelves on the walls to re-purposing organiser trays, spice racks, and pots to make a more organised space. 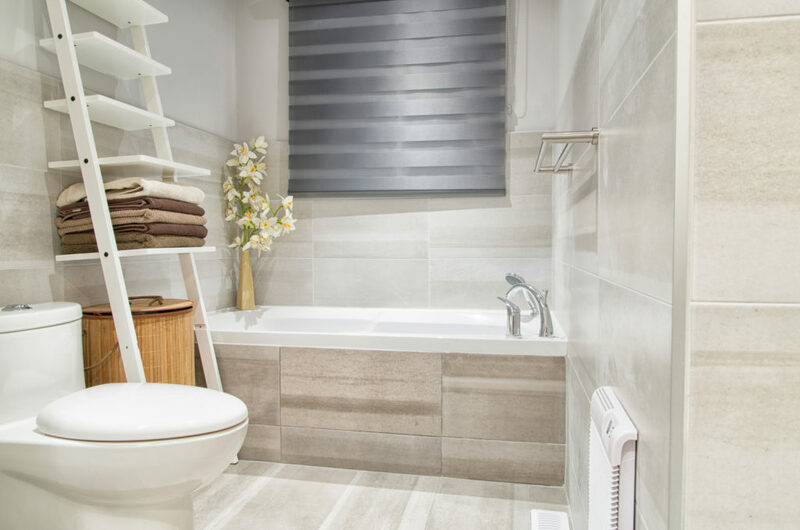 Some of the most popular upgrades people make to their bathrooms to reduce clutter include adding wall-mounted towel rails to keep towels on, hooks on the back of the door for dressing gowns, and extra shelves in the shower or on walls for toiletries.